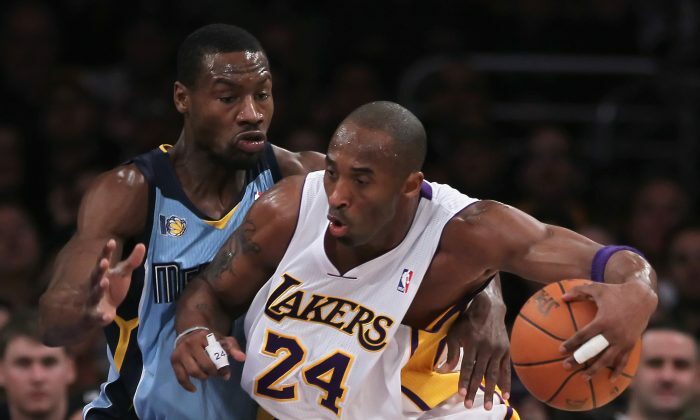 It’s safe to say that Grizzlies guard Tony Allen has the utmost respect of retiring Lakers legend Kobe Bryant. Bryant gifted Allen a signed pair of sneakers, addressed to the best defender he’s ever had to go up against, after Memphis’ 112–95 win over Los Angeles on Friday night. The stats seem to back up Bryant’s case. In their 33 matchups, Allen’s teams have now won 17 of them—although neither Bryant (sore right shoulder) or Allen (sore left knee) played in their latest matchup because of injury. The honor bestowed on Allen is no surprise, given his reputation around the league as one of the best perimeter defenders in the game. The 34-year-old has been named a first-team All-Defense selection three of the last four seasons. “It’s a complete honor, and I was flattered by the comment,” said Allen, in an interview on Sporting News. Allen went on to explain how he approaches guarding Bryant. Of course, few have been able to stop Bryant. The 37-year-old led the league in scoring in both 2006 and 2007 and is currently third in NBA history with 33,318 points. Had injuries not limited his playing time (and skills) he would have had a good shot to eclipse Kareem Abdul-Jabbar’s all-time 38,387 point-record. But Bryant suffered consecutive season-ending injuries in 2013, 2014, and 2015. The 49 games he’s played this season are more than he’s had the last two seasons combined. Yet, his shooting percentages the last two seasons (37.3 last year, 35.0 this year) are the worst of his career and this year’s 17.1 scoring average is the lowest he’s had in a season where he played more than six games since the 1997–98 season—when he was still a teenager. When healthy, he was one of the greatest of all time, making 18 All-Star teams and being named to one of the All-NBA teams 15 times—including 11 first-team selections. The two-way player was also named to 12 All-Defensive teams. Sounds like James Harden is the GM.